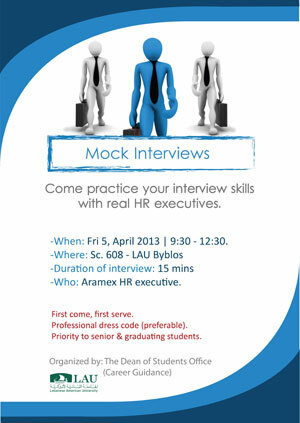 The Career Guidance Office is organizing Mock Interviews to help you practice your interview skills with real HR executives and to better manage your first interviews upon graduation. 3. Email your CV (to Rana Sakr: rana.sakr@lau.edu.lb) and the job (A, B, C, D) you have selected. Priority will be given to those graduating in Spring 2013. You will receive a confirmation email if you have been selected for the interview.